I woke up the morning after our epic walk from Sgurr na Ciche to Gairich surprisingly unstiff but feeling fatigued. The morning greeted us with a spectacular sunrise. It was cloudy but the clouds were well over the summits. We prepared our breakfast al fresco – porridge and tea in my case. The story of our previous day can be found here. Tzvetie was determined to bag some more Munros. I am sure that I would have been happy to go to the nearest tea shop (probably some distance away) or amble up a nearby bump instead. 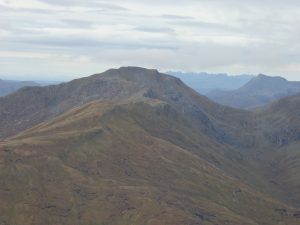 The obvious Munros were Gleouraich and Spidean Mialach and/or Sgurr a’Mhaoraich. I compromised with her by agreeing that we would not try to combine all three Munros! Breakfast over we drove the short distance to just beyond the bridge over the northern arm of Loch Quoich. Hidden amongst the rhododendron bushes is the start of one of the best stalker’s paths in the Highlands. It lifts you easily up the southern arm of Gleouraich giving spectacular views along Loch Quoich to Sgurr na Ciche and the other hills we had been on in the previous days and along an airy highway above the arm of Loch Quoich. It ends at a pony stance from where a rough path climbs steeply up the final 200m (660ft) of ascent to the summit. This was my fourth ascent of this hill. The summit is a grand viewpoint. We could also see Sgurr a’Mhaoraich, Bein Sgritheall and distant Skye to the west. 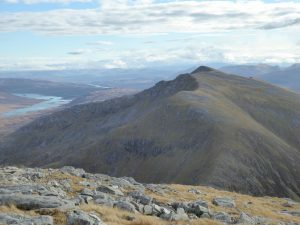 The South Glen Shiel ridge to the north and even a mist covered Ben Nevis to the south east. From Gleouraich a ridge leads east over a subsidiary top from where this shot was taken back to the main summit of Gleouraich. And on towards the rather bland slopes of Spidean Mialach after a significant drop in height. Despite the fatigue I still made it from the start to the summit of Gleouraich in 1 hour 50 minutes and from there to the summit of Spidean Mialach in 1 hour 30 minutes. 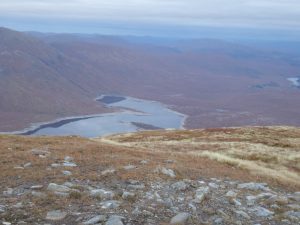 Here are some pics from the top of Spidean Mialach. It was noon when we got there. Until someone gets in the way! Now the sun was out and producing a little warmth. We lounged around on this top for a while. There is a path all the way down from the summit to the road. As we neared the road we encountered a group of 4 guys just starting out up Spidean Mialach, perhaps a bit late in the day considering it was October. We were back at our cars after a round of 6 hours and drove back to Fort William where we treated ourselves to a pizza. Then I drove down to the Lake District for an appointment the following day in Ambleside! As part of my preparations for my trip to Antarctica I wanted to do an extended trip to improve fitness and resilience, preferably an overnighter, therefore carrying some weight over a couple of days. An opportunity arose towards the end of October to meet up with Tzvetie whom I had met on my Elbrus trip a few months earlier. 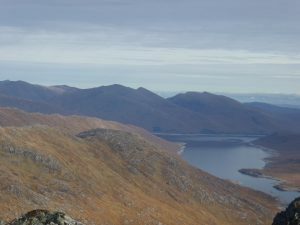 She was up for such a trip and, living in Fort William, was busy bagging Munros. 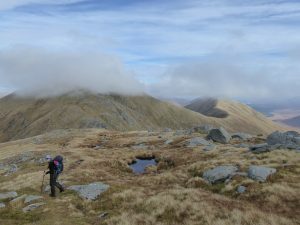 We agreed on a plan which would pick up six Munros and two Corbetts over three days. This would involve some remote country, including one of the most remote Corbetts, Ben Aden. 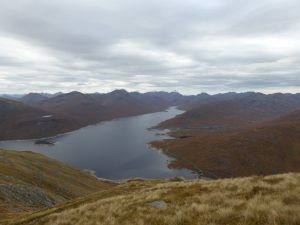 Ben Aden lies at the west end of Loch Quoich in the western highlands about 25 miles north west of Fort William as the crow flies, but probably twice the distance to the start point for the approach. 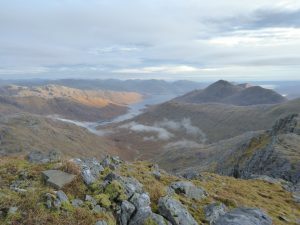 It lies at the eastern edge of the Knoydart peninsula at 887m (2,910ft) in height. It will not be visited that often. Its isolation sees to that. 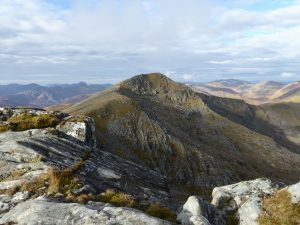 After that we would follow the long ridge between Sgurr na Ciche and Gairich, another set of relatively remote peaks. If we then felt up to it we would then do a separate walk up Gleouraich and Spidean Mialach. 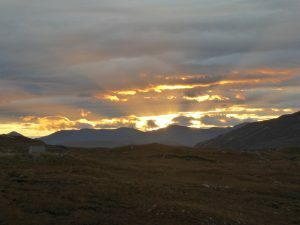 I travelled north on a Wednesday afternoon arriving in Fort William for an overnight stay a bit later than I had hoped. We discussed whether or not to take two cars (which we would) and what time we would leave… early! The following morning was foggy and so we made our way carefully to the minor road that leads 22 miles further on to a dead end at Kinloch Hourn. A little over half way along this road you reach the Quoich dam. Here we left Tzvetie’s car and then we drove a further 20 minutes past the northern arm of the Loch to the point where the road leaves the Loch before it plunges down to Kinloch Hourn. Here there is plenty of space to park and, indeed, there was a campervan there when we arrived. It was 7.45am when we set off on our adventure, about 1½ hours after leaving Fort William. The fog had cleared and the sun was lighting up the south eastern horizon with yellow, orange and red strips though the cloud above was grey black. It is about a 16km (10 mile) walk to the summit of Ben Aden from the start. The first section is across what sometimes forms the bed of the Loch. The alternative, if winter rains or snow melt has filled this section, is a diversion further west over higher ground. We decided to make bee-line towards the promontory directly opposite. It was not as wet and glutinous as I had feared. There were a few streams to cross and the black soil was occasionally a bit sticky, but it was only about 800m until we were on firmer ground. Here we found the traces of tracks over rough ground. Now the going under foot varied between firm and soggy with plenty of ups and downs. It is quite hard going. Across the Loch Sgurr na Ciche glowed in the morning sun. This was to be one of our targets for the following day. Indeed you can see where we were to camp that evening on the levelling of the ridge just above the cloud. After another 3½km (2 miles or so) we were faced with what can be a major obstacle. This is the Abhainn Chosaidh, a river that can be impossible to cross if in spate. Some careful balancing on rocks enabled a dry shod crossing to be made. Beyond, although we struggled to find it at first because we stayed too close to the lochside, there is an old vehicle track. This might sound strange but it is a relic of the time when Loch Quoich was being dammed. The Loch is dammed at both its east and its west ends. The dam at the east end is by far the largest one. But there are two smaller ones at the west end that take the Loch over the natural watershed. The dams were constructed in the mid 1950’s. The Loch surface was raised about 33m (100ft) in height and the surface area increased from 7.7 to 18 sq kilometres (3 to 7 sq miles). In the process Glen Quoich Lodge was destroyed. There is now a network of stalker’s paths that plunge down into the Loch, though many are being taken over by nature as they are no longer used. Edwin Landseer was among many fashionable sportsmen who came here in the 19th century, and his best known paintings were inspired by the red deer of Glen Quoich. 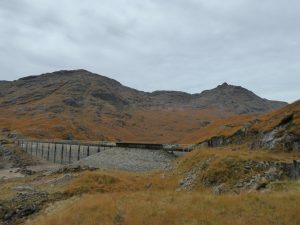 The track that we were now on was created to transport materials to create the western dams and then was largely submerged when the Loch was filled. As can be seen from the photo above, the track is deteriorating and was quite wet in places. Once past the Abhainn Chosaidh there was a further 5 kilometres (3 miles) to the western dams. It had taken us almost 3 hours to reach this point. We stopped for 20 minutes for some refreshment and to decide which way to tackle Ben Aden which now stood just beyond but still 630m (or over 2,000ft) above us. 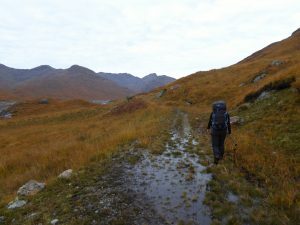 Guidebooks suggest that one should follow a path towards Lochan nam Breac and then make one’s way into the rough corrie of Coire na Cruaiche. 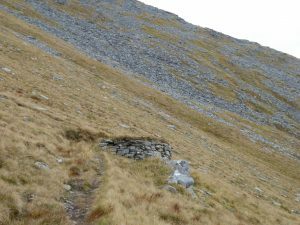 I had spotted an alternative stalker’s path marked on the map which led up the eastern slope of Meall a’Choire Dubh. So we decided to go for that alternative. Whether that was the fight decision I do not know – possibly not. At first we missed the start of this path because through lack of use it is indistinct. Once found, it was obviously a beautifully constructed path but now unused and unmaintained. Parts were still supported by little embankments with dressed stonework. Views opened up back over Loch Quoich. Unfortunately the path stopped where it was shown to on the map, at a small cairn. From there to the top of Meall a’Choire Dubh there ground was very broken and this continued all the way along the broad ridge to the final climb to Ben Aden. The guidebook route would have avoided much of this. We had another break part way along the ridge and contemplated our location and that final climb. It was stunning. 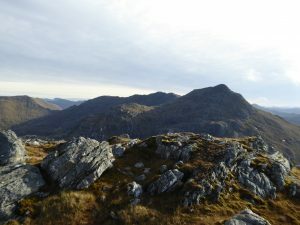 To the south was Sgurr na Ciche; to the north was the long ridge of Sgurr a’Choire-bheithe. 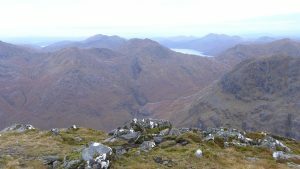 Ben Aden largely hid the view west but there were glimpses into Knoydart. It was sunny and, for October, warm with little wind. We toyed with the idea of leaving our packs on the ridge but it was so broad with ups and downs we feared we would not find them again. We made short work of the final 200m (660ft) of ascent. There were a couple of steeper and narrower sections. But it was 7 hours since we had set out by the time we arrived, an indicator of the rough nature of the ground. The views were stunning. This is what we saw. 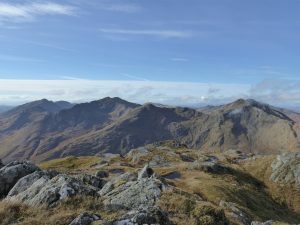 First Luinne Bheinn and Mell Bhuidhe, remote Munros on the Knoydart peninsula. 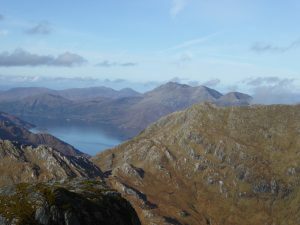 Then a zoomed shot of Beinn Sgritheall above Arnisdale on Loch Hourn. A view to The Saddle. Gleouraich and Spidean Mialach above Loch Quoich. 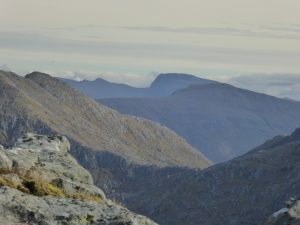 Even a distant Ben Nevis seen in this zoomed shot. 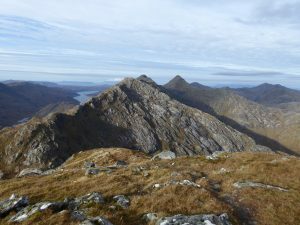 And finally Sgurr na Ciche. This last shot also shows Garbh Chioch Mor, Ben Nevis on the distant horizon and where we were to camp on the north east ridge of Sgurr na Ciche (where the shadow cuts across the ridge just to the right of the bump). We spent a good half hour on the summit. Having taken so long to get there (and we were a little weary) it merited a sit down and appreciation of the location. But time marched on. It was approaching 3pm and daylight hours are not long at this time of the year. We did not then know precisely where we would set up camp and there was still much rough ground to cover. 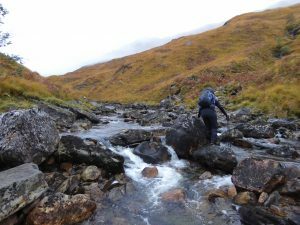 We found a better way down and along the ridge back towards Meall a’Choire Dubh (eventually keeping to the right (south) as much as possible) and worked our way to the foot of the north east ridge of Sgurr na Ciche where we found a welcome stream burbling down from above. Water might not be available at any camping spot we found so we filled up our water bottles and I drank about ½ litre of water to attempt some re-hydration. Even in October you lose a lot of fluid. 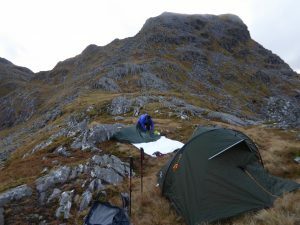 It was then a question of climbing the ridge until we found a suitable place to pitch the tents. 210m (690ft) higher we found somewhere suitable. It was 4.30pm, 9½ hard hours after we had started out. Tents soon up, dinner was cooked, tea made and I (for one) was glad to lie down and recover. If day 1 had been hard, then day 2 was to be epic! It was helped by the fact that our first summit was only 150m (500ft) above us, but it would involve over 24km (15 miles) of walking and 2,150m (7,000ft) of ascent. Our spell of settled weather continued but we were to finish in the dark. We packed quickly and were off by 6.30am. We followed a wall up most of the ridge. This was a wall that we would follow for some 5km (3 miles). We left it when it dipped down to the Feadan na Ciche (the col between Sgurr na Ciche and Garbh Chioch Mhor). Soon after we met the main path along the east ridge. We were able to leave our rucksacks here and enjoyed a lightweight final clamber to the top. To be on such a remote summit at 7am is a privilege. 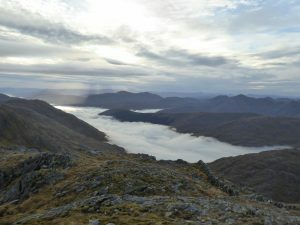 It was my third time up Sgurr na Ciche and the first one where I had a view! 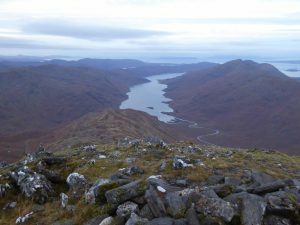 This is the classic view down the south west ridge to Loch Nevis. 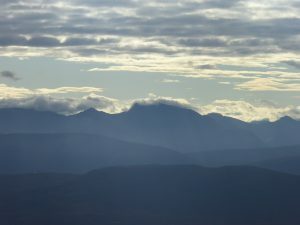 Garbh Chioch Mhor was just across the way with mist filling Glen Dessary and a distant Ben Nevis on the skyline. 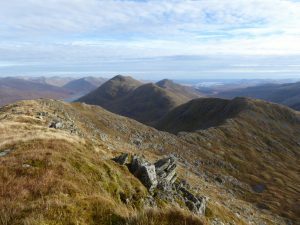 And a view over Knoydart and to Beinn Sgritheall. We could not hang around for long though. So we returned to our packs and continued down to the Feadan na Ciche which is quite a narrow notch. 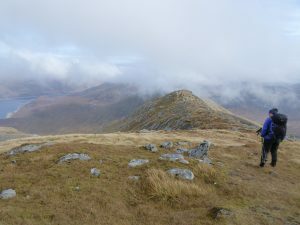 There followed a 170m (560ft) steep ascent up Garbh Chioch Mhor. As became common during the course of the day Tzvetie slowly but surely pulled away from me on the extended climbs. I was on the top by 8.15am with a view down to the mist filled Glen Dessary and the wall. Back to Sgurr na Ciche, the pyramid shape of which would ever so slowly recede from us during the day. 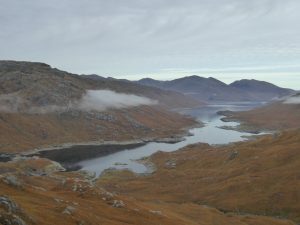 And down to the ever present Loch Quoich. This last picture also captures much of the rest of the route that day and indicated how much further we had to go as Tzvetie’s car was parked out of sight at the far end of the Loch. 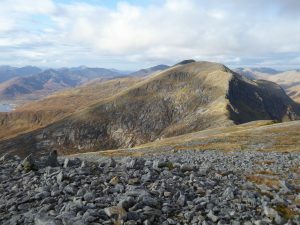 The ridge between Garbh Chioch Mhor and its subsidiary top, Garbh Chioch Bheag, gives some of the roughest walking you will encounter on the Scottish mainland. It takes us 30 minutes to walk the 1km between the two. Tzvetie had waited for me here and then we descended to the col between Garbh Chioch Bheag and Sgurr nan Coireachan together. Here the terrain becomes softer. We were still following the wall but the ground became less rocky. It was 10am by the time we reached the top of Sgurr nan Coireachan. Here is the view back the way we had come. 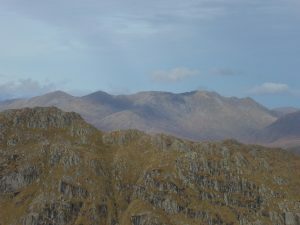 And the way on, showing An Eag, Sgurr Beag, Sgurr Mor and Sgurr an Fhuarain respectively. Our final peak of the day is hidden behind Sgurr an Fhuarain. I had last been along this section of the ridge (between Garbh Chioch Mhor and Sgurr Mor) in June 2000. 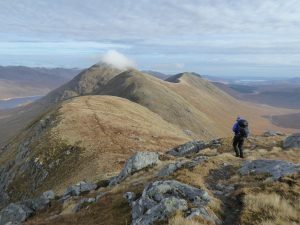 I had been with Sue as she was mopping up some final Munros before her “compleation” a week later on the Isle of Mull. On that occasion we had left Yorkshire early one Saturday morning and arrived at the end of Loch Arkaig to the south at 1pm. 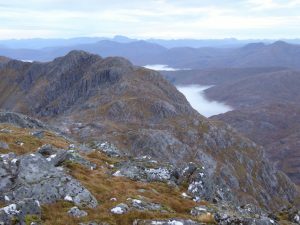 We had then set off and walked the ridge between Garbh Chioch Mhor and Sgurr Mor arriving at Sgurr Mor after midnight having no views from any of the summits. But beneath the cloud caps the weather was beautiful and we were accompanied by Brocken Spectres on the ridge between An Eag and Sgurr Beag. We returned to the car at 3am as the sun was rising, crashing there to grab 3 hours sleep before being woken up by sheep rubbing against the car. 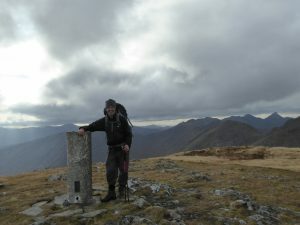 Sue then bagged another Munro on the Sunday before I drove back home the same evening. 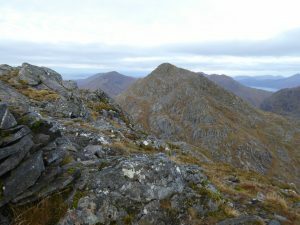 Here is the ridge between An Eag and Sgurr Beag. We had now lost the wall. The ridge was now grassy. At the col before the rise to Sgurr Beag a stalker’s path joins from both sides of the ridge and it continues up and over Sgurr Beag and on to Sgurr Mor. 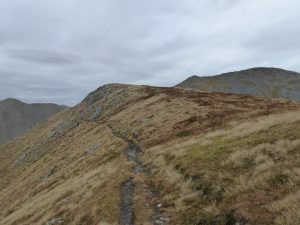 It deteriorates a little in places between the two Sgurrs, but it certainly assisted legs that were now becoming weary. 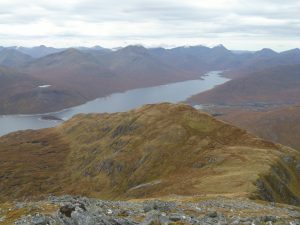 Here is a panorama back along our route from the top of Sgurr Beag. The pyramid of Sgurr na Ciche attracts the gaze. Unfortunately some cloud was coming in. 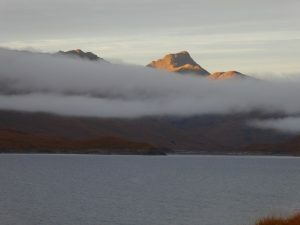 Sgurr Mor was lightly covered. On the ascent of Sgurr Mor Tzvetie stormed on ahead. She was sitting at the summit cairn as I arrived. We stopped for a bit in the cloud for food and drink before moving on. It was now 1pm. We soon dropped out of the cloud. We still could not see the end point of our walk which was still 11km (almost 7 miles) away as that crow flew and probably half as much again for us to walk. In fact looking at the map as I write this, we had only covered 1/3rd of the day 2 distance by the time we reached Sgurr Mor. 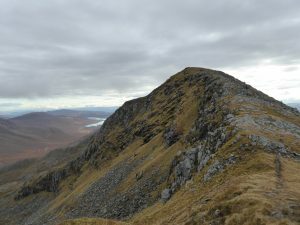 The next top was the Corbett, Sgurr an Fhuarain. This we reached fairly speedily at 1.50pm. It is rare that I make a second visit to a Corbett, but I had previously been here, alone, in February 2013 on (weather-wise) the most perfect of winter days. 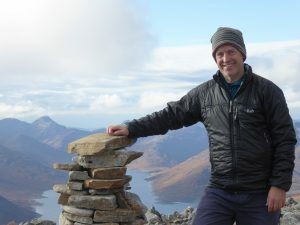 But here I am looking remarkably cheerful with the ever present Sgurr na Ciche behind me. Remarkably cheerful considering that we still had this hill to do – Gairich. This would involve a 340m (1,100ft) loss of height and slightly more on the re-ascent. It was here where we saw our one and only other person of the day. A single chap who, as he approached, looked as though he was walking a sheep. It was, of course, just a very large fluffy dog. 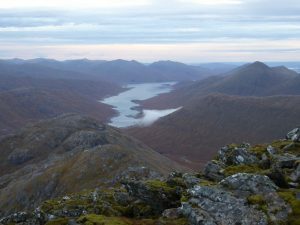 He had come up over Gairich from the dam and was planning to return back down Glen Kingie and around the far end of Gairich. His car was not at the dam when we finally ended the day. Again we had had a stop here for further refreshment though both water and food were now running low. Descent is via the north ridge where there is a stalker’s path. Of course we should have been going east, but that way is blocked by steep broken slopes. We had to leave the path before it skirted around Meall a’Choire Bhuidhe. The next kilometre was tortuous as we navigated our way across rough boggy ground. We did find a suitable stream for re-filling depleted water bottles. 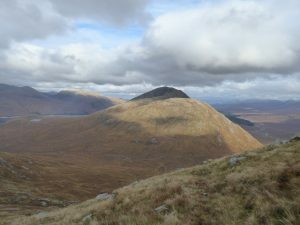 We were aiming for the stalker’s path that leads up the western slopes of Gairich Beag. I had seriously considered whether or not it would be possible to miss out Gairich, but the alternative routes looked as bad as going over the top of it! Eventually we reached the bottom of the path. For me it was a case of gritting teeth and getting on with it. Again Tzvetie pulled ahead. Eventually I lost sight of her. 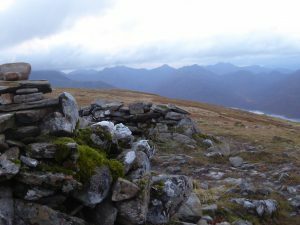 Unfortunately the path ends where it is shown as doing so on the map, shortly beyond a cairn two thirds of the way up. From there the ground continued to rise over a mix of small rocks and grass, albeit on less steep ground. Slowly making my way over the dome of Gairich Beag, I could see that there was still 180m (almost 600ft) of climb to do. I made out Tzvetie waiting for me in the shallow col a couple of hundred metres ahead. Only part jokingly I suggested we set up camp here and finish in the morning. I knew by now that we would be finishing in the dark. Another 15 minute rest, drinking plenty of water and eating the last of my food and we were off. The northern corrie of Gairich provides a pleasing shape to the way ahead. I made my way over to the corrie rim. That provided a handrail for further progress and once on the rim the gradient eased. 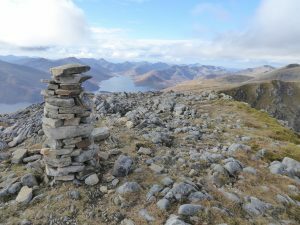 It was 4.55pm when the Gairich summit cairn was finally reached – 3 hours from Sgurr an Fhuarain. Light was fading. But the views were still nice if a bit gloomy. 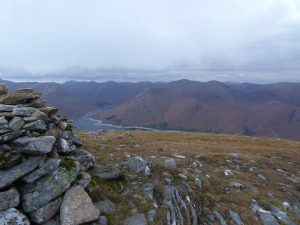 Here are Gleouraich and the distant Glen Shiel hills. And The (distant) Saddle and surrounding hills. And we could see now actually where our walk would end. 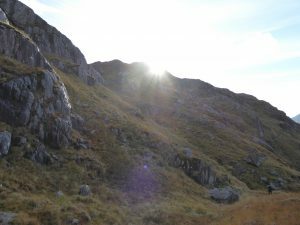 The way off Gairich to the east involves an initial steep section with a little bit of minor scrambling. I was keen to get through this section before the light finally went. So we did not stay long on the top, just time for photos and a drink. And we were safely down to the western end of the long, long (3km/2m) east ridge before the light finally went. It was then navigation by GPS and head torch. We managed to lose the path in the bogs and went slightly awry drifting too far towards Bac nam Foid, but were soon back on track. At the end of the ridge we dropped down to some woodland. The GPS was useful here to check that we followed the right path north. Again we stopped for 10 minutes in the dark for more water. I had warned Tzvetie that the next section was notoriously boggy. But in the end it was not too bad. Only once did we each manage to lose a foot in the bog. It was a relief to see the dam! There is a locked gate at the end of the dam by the road so we climbed it and flopped over and walked the final 30 metres to the car. Tzvetie then drove back to my car. Neither of us felt like cooking. We were past it. But I had in the car some Pringles and dips. So we shared these and they tasted like a gourmet meal! That day was certainly one of the hardest I have done in the UK. I think the experience can be classified as Type 2 on the Fun Scale (Google it if you do not know what this scale is).